For other uses, see Puppet (disambiguation). Puppetry was practiced in Ancient Greece and the oldest written records of puppetry can be found in the works of Herodotus and Xenophon, dating from the 5th century BC. The Greek word translated as "puppet" is "νευρόσπαστος" (nevrospastos), which literally means "drawn by strings, string-pulling", from "νεῦρον" (nevron), meaning either "sinew, tendon, muscle, string", or "wire", and "σπάω" (spaō), meaning "draw, pull". Aristotle (384–322 BC) discusses puppets in his work On the Motion of Animals. In India, puppetry was practiced from ancient times and is known by different names in different parts of the country. Excavation of clay dolls from Indus valley sites serve as an indication. The art of puppetry called Bommalattam is mentioned in Tamil literature Silappadikaram, which is written around 2nd century B.C. The black light puppet is a form of puppetry where the puppets are operated on a stage lit only with ultraviolet lighting, which hides the puppeteer and accentuates the colours of the puppets, which are normally designed using colours that respond to UV light by glowing brightly. The puppeteers perform dressed in black against a black background, with the background and puppeteer's costume normally made of black velvet. The puppeteers manipulate the puppets under the light, while they position themselves unseen against the black unlit background. Puppets of many sizes and types may be used. The original concept of this form of puppetry can be traced to Bunraku puppetry. Bunraku puppets are a type of wood-carved puppet originally made to stand out through torch illumination. Developed in Japan over a thousand years ago and formalised and combined with shamisen music at the end of the 16th century, the puppeteers dress to remain neutral against a black background, although their presence as a kind of 'shadow' figure adds a mysterious power to the puppet. Bunraku traditionally uses three puppeteers to operate a puppet that varies from 1/3 to 1/2 life size. Cantastoria is a form of visual storytelling in which a puppet, illustration, painting, or other visual medium is accompanied by rhythmical speech or song that describes or reenacts events to tell a story. Carnival puppets (also known as body puppets) are usually designed to be part of a large spectacle. These are often used in parades (such as the Mayday parade in Minneapolis, United States and The Cape Town Carnival in South Africa) and demonstrations, and are at least the size of a human and often much larger. One or more performers are required to move the body and limbs. In parades, the appearance and personality of the person inside is not relevant to the spectator. These puppets are particularly associated with large-scale entertainment, such as the nightly parades at various Disney complexes around the world. Similar puppets were designed by Julie Taymor for The Lion King. The Jim Henson Company also has their version of these puppets called full-bodied puppets. The finger puppet is a simple puppet variant which fits onto a single finger. Finger puppets normally have no moving parts, and consist primarily of a hollow cylinder shape to cover the finger. Finger puppets are often decorated with eyes and mouths made out of fabric or other materials. This form of puppet has limited application, and is used mainly in pre-schools or kindergartens for storytelling with young children. A hand puppet (or glove puppet) is a puppet controlled by one hand, which occupies the interior of the puppet. The Punch and Judy puppets are familiar examples of hand puppets. Larger varieties of hand puppets place the puppeteer's hand in just the puppet's head, controlling the mouth and head, and the puppet's body then hangs over the entire arm. Other parts of the puppet (mainly arms) are usually not much larger than the hand itself. Often the mouth can also open and close, and special variants exist with eyelids that can be manipulated. A sock puppet is a particularly simple type of hand puppet made from a sock. Also called a "two-man puppet" or a "live-hand puppet", the human-arm puppet is similar to a hand puppet but is larger and requires two puppeteers. One puppeteer places their dominant hand inside the puppet's head and operates the puppet's head and mouth, while putting their non-dominant arm into a glove and special sleeve attached to the puppet. The second puppeteer puts their arm into a glove and special sleeve attached to the puppet in order to operate the other arm. This way, the puppet can perform hand gestures. This is a form of glove or hand puppetry and rod puppetry. Light curtain puppet presentations use light to highlight small portions of a performance area, allowing the puppet to be seen while the manipulators remain invisible. The puppets stand on a stage divided into an unlit background and a well-lit foreground, meeting to form a "curtain" of light. The puppeteer dresses in black and remains hidden in the unlit background of the stage while the puppet is held across the light curtain in the lit foreground of the stage. "Light curtain puppet" is an umbrella term, and any puppet which is extended into a well-lit area where its handler remains separated from the puppet by a division of light may be called a light curtain puppet. Marionettes, or "string puppets," are suspended and controlled by a number of strings, plus sometimes a central rod attached to a control bar held from above by the puppeteer. The control bar can be either horizontal or vertical. Basic strings for operation are usually attached to the head, back, hands (to control the arms) and just above the knee (to control the legs). This form of puppetry is complex and sophisticated to operate, requiring greater manipulative control than a finger, glove or rod puppet. The puppet play performed by the Von Trapp children with Maria in The Sound of Music is a marionette show. Prominent Marionette Theaters operating today include: Salzberg Marionette Theater, Bob Baker Marionette Theater, Center for Puppetry Arts, Melchior Marionette Theater, The Swedish Cottage Marionette Theater in Central Park, Le Theatre de Marionette. Famous Italian puppet is Romeo Gallo. The marotte is a simplified rod puppet that is just a head and/or body on a stick. It was used by jesters in renaissance times. In a marotte à main prenante, the puppeteer's other arm emerges from the body (which is just a cloth drape) to act as the puppet's arm. Some marottes have a small string running through the stick attached to a handle at the bottom. When the handle is squeezed, the mouth opens. Motekar or wayang motekar is a kind of shadow puppet theater known in Sundanese, Javanese, and Indonesian as 'wayang (kulit)', that is, (leather) shadow puppet. While most shadow puppets cast black silhouettes from behind a screen, motekar shadow puppets can be in full color. They use plastic materials, transparent dyes, a special light system, and a special type of screen to make this happen. Motekar puppet shows can be performed by one or several puppeteers and usually feature music, singing, and a series of dances. Object Puppet of Nikolai Zykov Theatre, Russia. Not all forms of puppetry need specially created items to puppet. Object puppets can be created with found everyday objects either assembled in advance or during performance. Señor Wences was a Spanish ventriloquist who became popular through his appearances on the American program The Ed Sullivan Show. His characters included Johnny (a face drawn on his hand) and Pedro (a gruff head in a box) who would talk when Wences opened the box. Similarly, chinface puppetry involves puppet features drawn or attached onto an upside-down chin. A pull string puppet is a puppet consisting of a cloth body where in the puppeteer puts his/her arm into a slot in the back and pulls rings on strings to make certain movements such as waving the arms or moving the mouth. A push puppet consists of a segmented character on a base which is kept under tension until the button on the bottom is pressed. The puppet wiggles, slumps and then collapses. Push puppets are usually intended as novelty toys, rather than as part of professional puppet theatre. A rod puppet is a puppet constructed around a central rod secured to the head. A large glove covers the rod and is attached to the neck of the puppet. A rod puppet is controlled by the puppeteer moving the metal rods attached to the hands of the puppet (or any other limbs) and by turning the central rod secured to the head. Rod puppet "Bleeckie", meeting an owl, 2011. A shadow puppet is a cut-out figure held between a source of light and a translucent screen. Shadow puppets can form solid silhouettes or be decorated with various amounts of cut-out details. Colour can be introduced into the cut-out shapes to provide a different dimension and different effects can be achieved by moving the puppet (or light source) out of focus. Javanese shadow puppets known as Wayang Kulit are the classic example of this. In China, it became popular from Song Dynasty. A sock puppet is a puppet formed and operated by inserting a hand inside a sock. The hand is opened and closed to simulate the movement of the puppet's "mouth" and give the impression of speaking. Sometimes eyes and other facial features are added to the sock in order to make the puppet more realistic. Sock puppets are popular in many puppet performances, as they are simple to make and easy to use. They are mostly used in satirical or children's works. Supermarionation is a method of puppetry invented by Gerry Anderson, which he used in his television shows Stingray and Thunderbirds. The puppets were marionettes with electronically moving mouths to allow for lip-synchronised speech. The marionettes were still controlled by human manipulators with darkened strings. A table top puppet is a puppet usually operated by rod or direct contact from behind, on a surface similar to a table top (hence the name). Shares many characteristics with Bunraku. A Ticklebug is a type of hand puppet created from a human hand to have four legs, where the puppet features are drawn on the hand itself. The middle finger is lifted as a head, and the thumb and forefinger serve as a first set of two legs on one side, while the ring finger and little finger serve as a second set of two legs on the opposite side. The toy theatre is a puppet cut out of paper and stuck onto card. It is fixed at its base to a stick and operated by pushing it in from the side of the puppet theatre. Sheets of puppets and scenery were produced from the 19th century for children's use. The Ventriloquist's Dummy is a puppet shaped like a small human which is operated by a ventriloquist performer to focus the audience's attention away from the performer's activities and heighten the illusion that the dummy is speaking. They are called dummies because they do not speak on their own. The ventriloquist dummy is controlled by one hand of the ventriloquist. Ventriloquism acts are not always performed with a traditional dummy; occasionally other forms of puppetry are used. 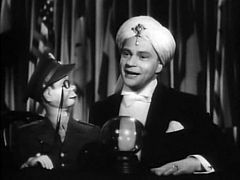 Edgar Bergen, seen with Charlie McCarthy, is one of America's best known puppeteers. Ventriloquist Ramdas Padhye has been performing in India for over 40 years. After popular American performer Shari Lewis died, daughter Mallory continued performing Lamb Chop. Performers like Jeff Dunham, here with Achmed the Dead Terrorist, have revived interest in North America. German Jörg Jará's puppet, Olga. A water puppet is a Vietnamese puppet form, the "Múa rối nước". Múa rối nước literally translates to "dance underwater" or "dancing underwater". This is an ancient tradition that dates back to the 10th century. The puppets are built out of wood and the shows are performed in a waist-deep pool. A large rod supports the puppet under the water and is used by the puppeteers to control them. The appearance is of the puppets moving over the water. When the rice fields would flood, the villagers would entertain each other using this puppet form. The water also provides the setting for traditional stories depicting day-to-day village life. Water puppets bring wry humor to scenes of farming, fishing, festival events such as buffalo fights, and children's games of marbles and coin-toss. Fishing turns into a game of wits between the fisherman and his prey, with the fisherman getting the short end (often capturing his surprised neighbor by mistake). Besides village life, scenes include legends and national history. Lion dogs romp like puppies while dragons exhale fire and smoke and shoot sprays of water at the audience. Performances of up to 18 short scenes are usually introduced by a pig-tailed bumpkin known as Teu, and accompanied by a small folk orchestra. The word puppet can mean a political leader installed, supported and controlled by powerful external forces, without legitimacy in the country itself. In modern times, this usually implies no democratic mandate from the country's electorate; in earlier times, it could have meant a monarch imposed from outside, who was not a member of a country's established ruling dynasty, or unrecognised by its nobility. "Puppet government", "puppet regime" and "puppet state" are derogatory terms for a government which is in charge of a region or country, but only through being installed, supported and controlled by a more powerful outside government. An example is Vidkun Quisling, a Norwegian fascist leader during World War Two who collaborated with the Nazis and led a puppet government. Sock puppet is used on social media as a term to describe fake accounts used to spread political disinformation. Look up puppet in Wiktionary, the free dictionary. The Muppets, a cast of puppets from an American TV series. ^ Aristotle, On the Motion of Animals, 350 BC. ^ "Pulling the strings to resuscitate a dying art". The Hindu. Thanjavur, India. 17 August 2012. ^ "Puppet Forms of India". Centre for Cultural Resources and Training, Ministry of Culture, Government of India. Archived from the original on 15 May 2013. Retrieved 24 June 2013. ^ "Puppet show at PNCA mesmerises children of twin cities". Daily Times. Islamabad, Pakistan. 5 July 2011. ^ Tytti Ollila (2 April 2012). "Shadow puppetry brightens those dark days". GB-Times. Retrieved 24 June 2013. Ghosh, S. and Banerjee, Utpal Kumar, Indian Puppets, Abhinav Publications, 2006. ISBN 81-7017-435-X. Bell, John, Strings, Hands, Shadows: A Modern Puppet History, Wayne State University Press, 2000. ISBN 0-89558-156-6. Wikimedia Commons has media related to Puppets. Bell, John (2000). Strings, Hands, Shadows: A Modern Puppet History. Detroit, USA: Detroit Institute of Art. ISBN 0-89558-156-6. Currell, David (1985). The Complete Book of Puppetry. London: A & C Black (Publishers) Ltd. ISBN 0-7136-2429-9. Flower, Cedric; Alan Fortney (1983). Puppets: Methods and Materials. Worcester, Massachusetts: Davis Publications, Inc. Gross, Kenneth (2011). Puppet: An Essay on Uncanny Life. Chicago: University of Chicago Press. ISBN 978-0-226-30958-3. Logan, David (2007). Puppetry. Brisbane, QLD, Australia: Brisbane Dramatic Arts Co. ISBN 978-0-9804563-0-1. Mulholland, John (1961). Practical Puppetry. London: Herbert Jenkins Ltd.
Richmond, Arthur (1950). Remo Bufano's Book of Puppetry. New York: The Macmillan Company. Rump, Nan (1996). Puppets and Masks: Stagecraft and Storytelling. Worcester, Massachusetts: Davis Publications.